I did a two day tour of the Kaas plateau, the valley of flowers near Satara in Maharashtra, with Rafi, Vidyasagar and Gautham. 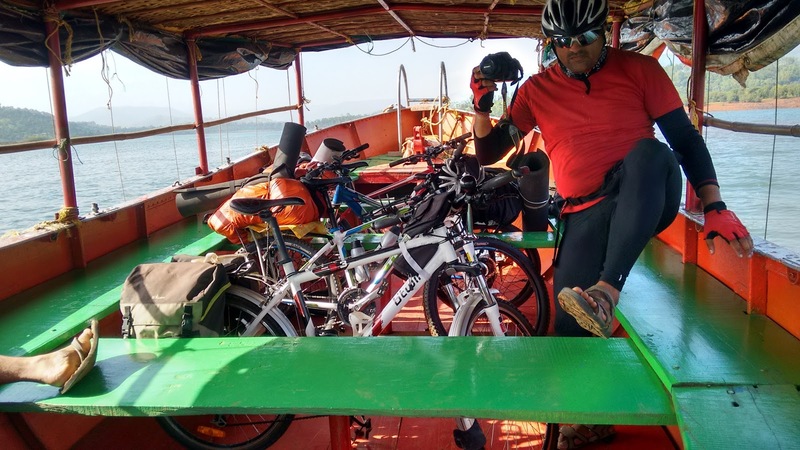 Rafi's plan was to take bicycles by Volvo overnight to Satara, then ride up to Kaas and camp somewhere en route to Mahabaleshwar. The second day, we would ride back down to Satara, and catch the returning Volvo to Bangalore. I wasn't entirely sure what to carry. I didn't want to carry too much, especially since the first day had a planned climb of over 1000m. On the other hand, I didn't want to be caught unprepared, for any issue, mechanical or otherwise. 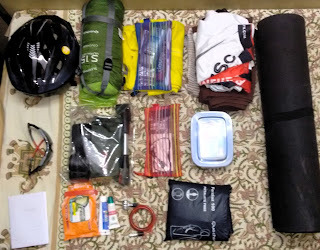 Finally, I settled on one pannier bag worth of stuff. Finally, I rode with a pair of panniers and a handlebar bag. This is the first time I was going to transport my bike on a Volvo bus, so I was not sure what to expect. I had read wildly varied reports on the mailing lists, so I was a little apprehensive, but followed this sequence, which worked well. Remove panniers, lights and bags. Put spacer in fork dropouts and a cardboard spacer in disc caliper. Tie pedal to downtube with velcro, tie front wheel to frame. The bike will need to be fixed to something in the cargo bay, and I had carried some nylon rope for this. Our four bikes fit together snugly in one compartment, so we did not need the rope. The bikes didn't jostle too much because we stuffed our camping mats between adjacent bikes. We had booked tickets on VRL through RedBus, after checking to make sure there will be adequate luggage space, and we were charged approx. Rs 1000 for all four bikes. We reached the bus station a good 45 minutes before departure and informed the staff that we had to load cycles, but they asked us to wait for the bus to arrive. The bus arrived just a few minutes before the scheduled departure, and the ground staff suddenly started asking why we didn't have a luggage ticket ready. Meanwhile the conductor started to hurry us to load the bikes quickly. I think this is just a tactic to get people to pay arbitrary fees without asking too many questions. We managed with two people loading the bikes and two handling the luggage ticket, but I imagine a solo traveller is bound to be harassed. The return from Satara was worse. The attendant was rough and careless loading the bikes - luckily he only caused some bad scratches. The VRL rep demanded Rs 2000 for the bikes, with some tall tales about RTO checking when entering Karnataka. This again, was a ploy to get us to cough up more money as "luggage fees". We refused to budge, showed him the oubound luggage bill and finally paid only Rs 1000. The bus deposited us on the outskirts of Satara at about 5am. It took us nearly two hours to set up the bikes and solve a little disc rub on one of the hydraulic calipers. 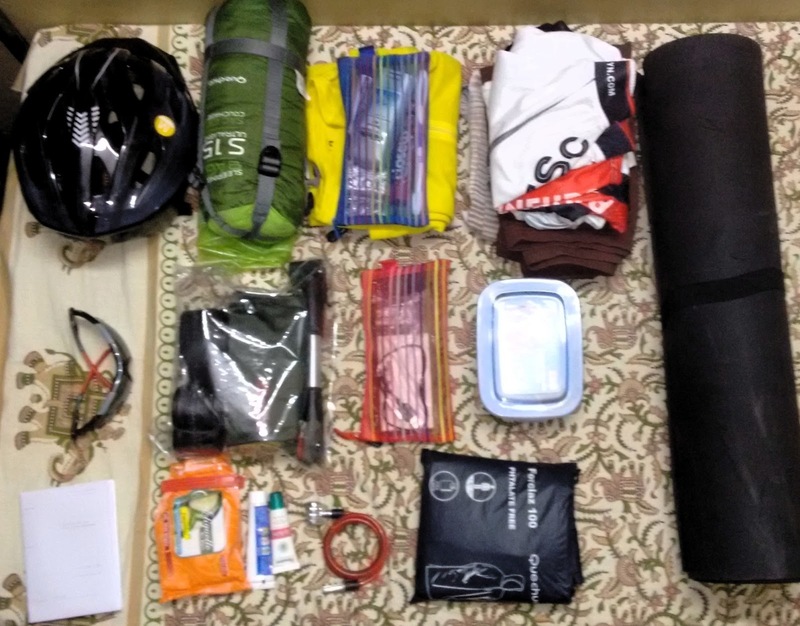 Note to self - practice packing and unpacking the bike at home. After a brief stop for the facilities at Satara bus stand, followed by some nice breakfast, we started climbing towards Kaas. The climb was easier and far more scenic than I had imagined. From Satara, the road climbs 500m over about 8km at a gentle, constant gradient to the top of a ridge. 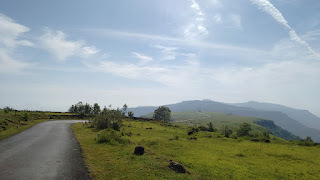 The road follows this ridge all the way to Kaas plateau, with Kanher reservoir on the east and Koyna reservoir on the west. from Mumbai and Pune, leaving litter behind everywhere. It was nearly 11am when we covered the 25km to Kaas, and we were slowing down too much. Kaas was not in its most majestic bloom (due to insufficient rains), but it was still captivating. Due to the long weekend the place was very crowded - the narrow road was clogged with cars and mini-buses. We had a quick lunch near Kaas lake, then headed on to see Kaas Vajrai waterfall, which is visible from just beyond Kaas village. It was past 2PM and our original plan of camping close to Mahabaleshwar seemed out of reach. The locals dissuaded us from riding in the Koyna forest after dark, so we decided instead to ferry ourselves from Bamnoli to Tapola. We cut almost 30km by going across the Koyna reservoir, instead of riding around it, hoping to cross the forest section by nightfall. 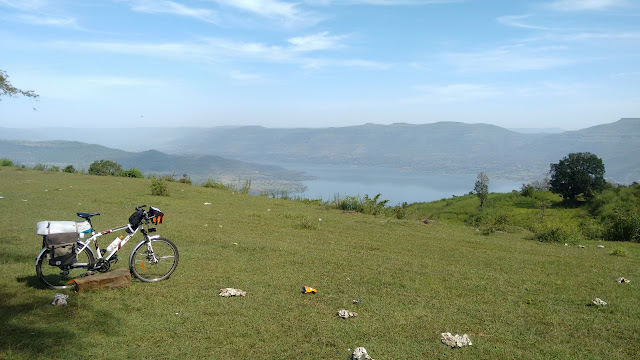 From Tapola, we climbed steadily 800m (net) to Mahabaleshwar over about 25k. There were only a few steep sections but the grade was otherwise gentle. We had planned to reach the campsite on the outskirts of Mahabaleshwar before dark, but we were too far behind. In the cold and dark we slogged silently, taking a few breaks on the way. The Koyna forests are home to a lot of wildlife including bears and tigers. The locals told us at most we might run into some Gaur - a rather large indian bison - and to stick together. We saw nothing more than monkeys and some snakes though, and reached Mahabaleshwar without incident. After a hot dinner in the main market we headed to Mahabaleshwar lake, where we pitched camp. Nice write-up Abhijit, it refreshed my most memorable journey with you.